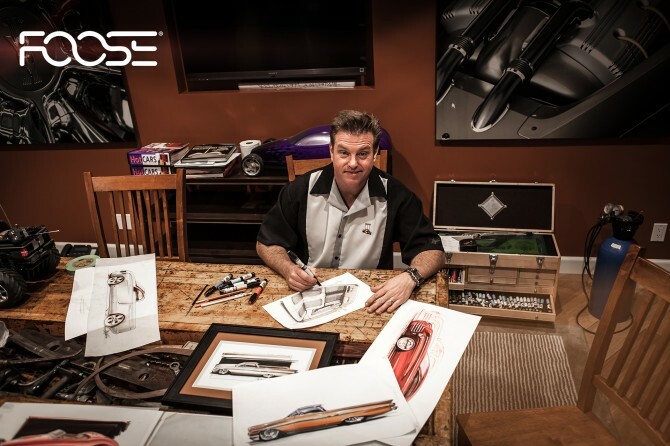 Chip Foose has been creating automotive works of art for over 23 years, chopping up some of the most revered vehicles on the planet and creating one-of-a-kind rolling and driving masterpieces. Now, he has his talents set on the AmericanMuscle car show on August 11th where he will be surveying the endless amount of Mustangs in attendance, answering questions and engaging in some good, old-fashioned shoptalk. Those who may not know Chip from his masterful Mustang creations might recognize him as the star of the reality TV series Overhaulin’ on the Velocity channel. One lucky and dedicated Mustang owner will have their car hand selected by Chip and personally sketched live at The Show! What could be better than winning an award and having the man who selected it personally sketch your Mustang for you? Chip’s favorite car will be announced and presented live, then the owner will receive the award while Chip Foose hand sketches the winning Mustang. The 5th Annual AmericanMuscle Mustang Show is the largest Mustang-only event in the country. Each year we organize this show to display our appreciation to our customers, fans, and fellow Mustang enthusiasts and as a way to unite 1000+ Mustangs and close to 4,000 enthusiasts for a full day packed with cars, contests, food, awards and more! This event has raised more than $55,000 for charity! This year we’ll be supporting Alex’s Lemonade Stand and the fight against childhood cancer. This year’s show is going to be insane–we look forward to seeing all of you there and hope you are as excited about The Show as we are! Next Entry Can’t Make it to This Year’s Car Show? Follow us From Anywhere! I’ve got a 91 Mustang GT that I purchased recently and absolutely love it! Need it restored to its former glory… or better yet Foosed Out!! Would really appreciate it. I’m in Walpole MA right around the corner from Foxboro Stadium home of the Patriots! I live right down the street from the show and can’t wait!!! I have a 1996 SVT Cobra that I have been working on and hope to have show ready by next year. Chip Foose could speed that process up with his awesome restoration skills!!!! Chip Foose is a visionary. I’m a huge fan and can’t wait to meet him. I’m lucky enough to be an owner of a 2007 Foose Stallion. My kids are soooo excited. Coming from Ontario looks like an awsome event!!!! Skip is the best in the industry and I have been a long time fan of your choice of car’s and I have to admit that I am trying to find a place to start with the same thing as your status and and family.